My over all view of Jamboree was nothing but pleasure. Yes, the attendance was down, due to the NGS's event in Las Vegas prior to Jamboree. I understand many people needed to choose which conference to attend. SDGS understands this also. 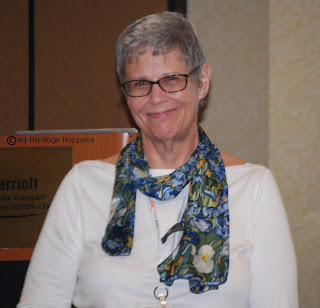 After all, how often does California have a National Genealogy Conference? I was booked to attend in Las Vegas and was excited about going, but when my husband said we were invited on an Alaskan cruise during that time, I couldn't disappoint and not go. I love traveling, and sometimes life is a give and take situation, I missed Vegas. But getting back to Jamboree 2013, even though the count was down this year, I really enjoyed it! Rooms were not crowded and I didn't get turned away from any classes due to being full. Next year will inevitably be very crowded again, I know, and I will be prepared for that. On Sunday, our final day, I attended three more classes. The first two were all about Paula Stuart-Warren. As on all of the other days, I wanted to hear new people, new information. Paula's first class I attended was "Seeking your Comfort Zone as You Approach Different Repositories." Can I just say I went on information overload in this class! I wrote so many notes I hope I can decipher them. This is ON TOP of what was in the syllabus. Wow. Hope to use some of this information I learned in the very near future, and when I do I will share! Used with permission. Photo taken by cousin Jan Lundberg. 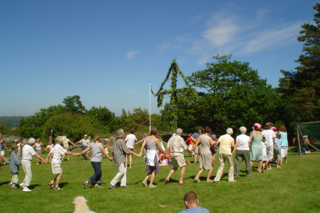 Sweden. 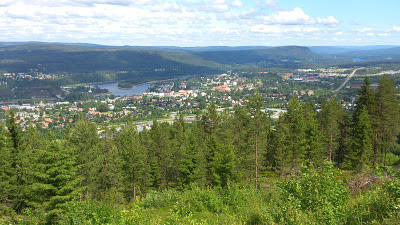 "Sollefteå. Ångermanälven winds beautifully through the small town. In the middle of town there is water..."
Well, Saturday came and I attended more classes! 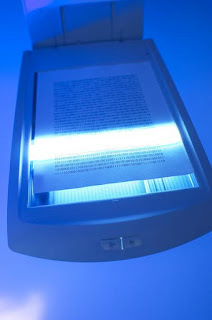 First on the list was D. Joshua Taylor ~ Preserving Digital Files. Another new speaker for me, I really looked forward to the session. Although I have taken other classes on preserving digital files, D. Josuha Taylor covered things that were new to me. Metadata, added a few new notes and Version Tracking was a whole new topic I had never thought about. I thought D. Josuha Taylor was a very knowledgeable speaker, and I know he is going to be rocking the genealogy world even more than he has already. 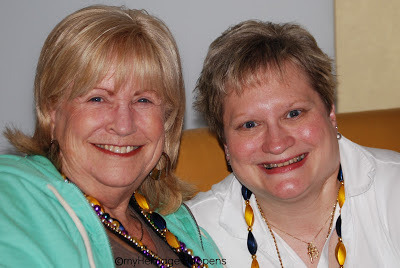 Easy as Apple Pie ~ Using Macs for Genealogy. 2) Tell us which GMP you use, and howmany persons, places, sources, etc. are in your database(s) today in a blog post of your own, in a comment to this blog post, or in a Facebook status or Google+ stream comment. I say a tiny bit because I am referring to my extended family! The cousin I have been in communication with for the past few years, his daughter, Rebecka, is actually in California! I tried to keep my hectic schedule open so I could go meet them but not knowing when they will be where and what days they will have free hasn't made it easy. If worst comes to worse, we will meet in Sweden later this year. On Thursday evening, having completed registration, I was able to read more about the classes that were being offered opening day. Generally, I have already chosen the classes I wish to attend. Once I get that almighty "pink sheet" though, every class is up for grabs all over again! Sometimes it is difficult choosing a class, there may be three or four classes you wish to attend that are all being offered at the same time! On rare occasions, for me anyway, does it seem that there isn't a class I wish to check out. This year, and I believe last year I felt this way also, I wanted go to classes of those I have never heard lecture before. 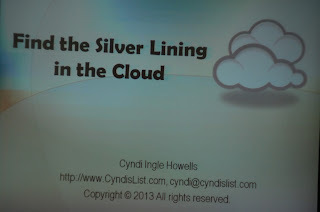 So, the first class I chose was Cyndi Ingle Howell's lecture on "Finding the Silver Lining in the Cloud." Unfortunately, I was at an angle when taking this photo, please know, Cyndi's posting of this is NOT crooked! On June 10 I posted Jamboree 2013 ~ First Day. This post brought you to the cemetery I went to visit, Rose Hills. 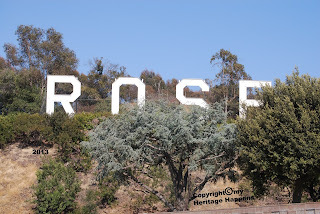 The Rose Hills sign has been a Los Angeles landmark since apparently sometime in the early 1940's. Rose Hills it's self was started in 1914. Originally the sign was at a much lower level, but now it sits at the top of one of the hills. It is supposedly a neon sign. The lights were turned of in the 1970's to save money but the FAA made sure the sign was lit again as airline pilots used the sign as a navigational point. Here is a photo of the entrance to gate 17. There are at least 20 gates to this cemetery. Here are a couple of photos taken from the top of one of the hills. It is a shame it was so foggy, from here I could actually see Los Angeles and it's tall buildings in the back ground, which is difficult to see in this photo. Another view from off to the other side. Here is one of the Rose Gardens. Jamboree 2013. Burbank. Cheryl Palmer. California. 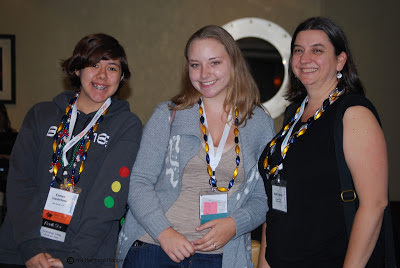 This was the fifth year I have attended SCGS'S Genealogy Jamboree. I am not sure if I go to learn something new, to meet new people or to hang out with the ones I have already met. Really it is a combination of each of these things! A few of my beads, pins and things from prior Jamboree's. 2010. Cheryl Palmer, California. This year was the first time I have flown to Burbank. What a pleasure! Not that I mind driving, I don't. There wasn't anyone this time who "needed" someone to drive with so I choose to fly and stay at the Marriott Hotel. So convenient. The hotel is right next to the airport. The ability to drop things off in my room and pick them back up at a moments notice was great, even though I already experienced this luxury during previous years as Gini Webb has always let me use their room whenever needed. This time however, I didn't have to bother them. Looks like this year has turned into a photo kind of year, which actually was not part of my plan for the year. Besides the hundreds of digital pictures I am labeling, I started another project, like I had nothing else to do, right? It's Jamboree's fault. After the surprise wore off when I was reminded Jamboree is already next week, I decided I had better prepare for the trip. One of the things I needed to do was get together photos and/or documents to take advantage of the FREE Ancestry scanning being offered. I have used this wonderful service before at Jamboree and definitely plan to use it this year, I am so happy they are offering it again.